Water hose timers make a gardener’s life so much easier, and allow gardeners some flexibility in their schedule. After an extensive examination of the market, we’ve found the best hose timer: the Instapark PWT-07 Programmable Hose Timer. The Instapark PWT-07 got the top choice because it is extremely user-friendly, waterproof (IP66 rated), durable, has a manual rain delay setting, and can be configured in a wide variety of ways. This is the best Garden Hose Timer. For further information, see our Product Reviews Section below. 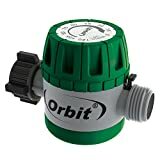 The Orbit 62024 Single-Dial Hose Watering Digital Timer was our choice for runner-up due to its ease of use and reliability, as well as its great low price. You set this unit manually, so there is no digital readout to malfunction or drain the battery. For further information on the Orbit 62024, see our Product Reviews section below. Finally, we picked the Orbit 62034 Mechanical Watering Timer as our best budget choice because it is so simple to operate, there are no batteries to change or sophisticated mechanics to malfunction and you don’t have to program it. On top of that, the great low price will leave lots of cash in your wallet for summertime fun! See below for further information on this Water Hose Timer. What’s not to love about summertime? Green lawns invite us to play or relax, beautiful plants and bountiful gardens are some of the greatest pleasures of the season. So are vacations, camping, and other warm-weather activities. Ball games, picnics, the beach, you get the drift. But, what happens when your commitment to keeping all that lush beauty watered and thriving clashes with activities you want to enjoy? And, what about leaving for a week or two on that grand summer adventure—who will take care of the plants while you’re gone? These timing conflicts can take the wind out of your summer sails in a hurry, and your plants can suffer the consequences. You could install an irrigation system but that could run anywhere from hundreds (check out our info on DIY Garden Irrigation Systems) to thousands of dollars. One great solution is to add automatic hose timers. For a fraction of the cost, you can program your timers to water when you aren’t able to, saving both water, time and your summer plans! Today we will be reviewing five hose timers, looking at value, function, ease of use and durability. All of these timers are easily installed, by inserting the timer piece between the garden hose spigot and the garden hose. They all open and close the garden hose valves at set times, allowing you to spend your time doing other fun summer stuff! We’ll start with a comparison table to get the lay of the land. After that, we’ll go in depth into each of the options, and conclude with a summary of our favorites. If you’re a gadget lover, be sure to consider a Wifi Water Hose Timer! It offers a large variety of settings to accommodate any watering situation, a manual rain delay setting, a waterproof housing, and a durable housing. All for a great price! The Instapark PWT-07 Digital Programmable Hose Timer is our top choice because we believe it provides the most features for the price, making it a great value. The company also offers excellent customer service if you should need help. Add to that its durability factor, made out of strong ABS plastic, and that it has a waterproof rating of IP66 and you have a home run with this unit! The Instapark PWT-07 is a single outlet unit, so you can only plug in one garden hose (we love the Flexzilla) at a time. It is a cinch to program using the large rotary dial and four easy to follow pushbutton settings. The digital display provides all the information you need on timing and function. The Instapark will run up to 4000 times from two fresh AA batteries, so you’ll almost certainly not need to change the batteries more than once per season unless you like to water in 10-second increments! With the Instapark PWT-07, you can set your watering duration of up to six hours. Users can choose from 16 different settings for watering frequency, anywhere from every ten seconds to once per week. It can be programmed to run every 24, 48 or 72 hours and it has a manual override as well as a rain delay feature for skipping watering during rainy days. Unfortunately, it doesn’t have a rain sensor, so you’ll have to adjust it manually if you want to delay it due to rain. The Instapark PWT-07 is a dependable and extremely functional hose timer positioned at a great price point. With the Instapark you can set it and forget it, leaving more time for what you really want to be doing this summer instead of watering you yard-playing in the sun! The Gideon is another digital hose timer, though its primary distinctive feature is the dual port system. This is a dual port system so you can set the timer to water two different areas off of the same unit (i.e. you can plug in two garden hoses). The Gideon features an easy to read digital display screen with plenty of options for setting duration and frequency between your two ports. And it comes with easy to follow instructions to get you going in no time! The Gideon Dual-Valve Hose Irrigation Water Timer gives the added value of having an extra port so you can water two different areas from the same faucet. It also has a large, easy to read digital screen that provides an abundance of information regarding settings and cycles, such as, when the cycle is due to start, how long until the next cycle, runtime and so forth. The Gideon is easy to program and has plenty of options for watering time and duration, from several times per day, to what days in the week you want it to run. Each valve can be programmed separately to run at completely different times/days, they work completely independently. The price is pretty reasonable for the Gideon Dual-Valve Hose Timer, and it has some great features. However, there are several reports that the Gideon begins to leak almost immediately upon installation. Additionally, customer service hasn’t been great at sending out replacement units. 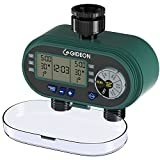 The Gideon Dual-Valve Hose Irrigation Water Timer is a great concept with its double port set-up and easy to read and program display. The price is right, and many people are quite happy with their Gideon hose timers. However, the quality control issues are a concern, as is the customer service. The Orbit 62024 is a great timer if you don’t like the hassle of programming a digital timer. The analog programming system of the 62024 is simple and straightforward, and if you don’t need to tweak your settings regularly, you’ll likely find this sort of system more than adequate for your requirements. The 62024 can be set to water every day, every other day or every third day anywhere from two minutes to 90-minute cycles. The Orbit 62024 Single-Dial Hose Watering Digital Timer is our runner-up choice due to its simplicity of operation, durability, and cost-effectiveness. It gives you the ability to program the day you want to water, and the duration of watering. All with an easy to use and read dial, and no need for fancy programming. Let’s face it, Apple didn’t design these LCD interfaces, and many of the digital units have pretty awkward controls. If just want to water your plants and not worry too much about it, the 62024 is a great option for you. Select the amount of time you want to water. It is important to note: this unit will only water once each day. The Orbit 62024 is a simple hose timer for those that want a no-fuss water timer that just works. It’s ideal for those who aim to water their lawn or garden once per day, but who don’t want to have to manually start the timer each session. You can set it where you want it, then go about your other business, and this little hose timer will keep things watered. This unit runs off of two AA batteries that are not included. It is a middle ground between a fully manual timer and a fully digital programmable one. It is water resistant, quite durable and comes in at a great price point. It’s probably not ideal for gadget geeks, but it is perfect for those who want a streamlined watering solution. Orbit offers a six-year limited warranty with their garden products, although there has been some concern regarding their responsiveness in the customer service department. The Orbit 62024 Single-Dial Hose Watering Digital Timer offers a nice balance between a fully programmable digital display unit and a manual timer that needs to be set each time. For the folks that are a little put off by all the bells and whistles of some other fancier units, this is the perfect solution. As long as you don’t need to water more than once per day! This hose timer is an Orbit best-seller. It is fully programmable with an easy to read and program digital display, offering watering options from every six hours to once per week, and many intervals in between. It has a brass swivel connector that attaches easily to your outdoor hose or faucet. The Orbit 62056 One Outlet Single-Dial Hose Faucet Timer is completely programmable, unlike the previous Orbit hose timer reviewed. It has a single port output to attach your garden hose to and a brass swivel connector going to the faucet for maximum durability. It has a water resistant, but not waterproof, case. It has been suggested by several consumers that you cover your unit with plastic or some other means to keep it from getting too wet. Several people have complained that once their hose timer got wet (water inside the unit) it stopped working. There were also several complaints that the unit leaked after initial installation or shortly after, and as with the previous Orbit, the customer service department was not very responsive. The Orbit 62056 features a manual override if you want to water off schedule or use the hose for another purpose as well as a rain delay for maximum water savings. This unit seems easy to program with large descriptive buttons and a display that lets you know where you are in the watering cycle. It comes with a six-year warranty. The Orbit 62056 One Outlet Single-Dial Hose Faucet Timer is very functional and easy to program with a host of settings to cover all your watering needs. It comes with a brass fitting, which is a nice feature at this price point. Although it has a six-year warranty there have been several issues with quality control and the customer service department could be better. The Orbit 62034 is a simple set-and-forget garden hose timer that doesn’t require, programming, digital user interfaces, or even batteries! This one is more like a kitchen egg timer than a programmable water hose timer. You turn it on for the duration you want, and it shuts off at the appropriate time. If you find that you often forget to shut off the water, this is the perfect hose timer for you. The Orbit 62034 Mechanical Watering Timer is our budget-friendly pick. Its simple design makes it easy to use, and the simple design means that it has fewer parts to break, and fewer things that can go wrong. You don’t need batteries for this timer, and it comes at a fantastic low price, making it the best value of all the timers reviewed. If you need a timer you can program and leave, this would not be a good option because it must be manually set each time. But you can set the duration to run for up to 120 minutes. The Orbit 62034 works just like a kitchen timer—simply turn the dial all the way around, then turn it back to the desired minutes. When it reaches the end, it stops watering. A few people have expressed some concern that you cannot program a specific start time—it starts at the time it is set. You can work around this by waiting until the desired time you want to water and then setting the timer. Of course, if you want to water at 4 am but don’t get up until 6 am, then you probably want to pick a different water timer! There have been a few complaints that the Orbit 62034 stops working after a few months, but there is a six-year warranty on this product if you find you have one that’s not working properly. The Orbit 62034 Mechanical Watering Timer is so inexpensive and easy to use, with very little that can go wrong. It’s a sturdy little unit and will do the job if you’re willing to set the timer each time you want to water. And, if it should quit working after a couple of seasons, you’re covered under warranty for six years! We have reviewed several hose timers in this article and selected three we thought stood out from the rest. Our top choice, the Instapark PWT-07 is extremely programmable, durable, and affordable. It’s perfect for those who want to have solid control over their garden water system, and want the power of a digital interface for control. Our runner-up is the Orbit 62024 Single-Dial Hose Watering Digital Timer. It has no digital display, just a simple, straightforward system to program your watering cycles. And finally, our budget-friendly pick is the Orbit 62034 Mechanical Watering Timer. It is simple and cheap, and ideal for those who want to water their yard when they choose and don’t mind setting the timer for each session. Having a hose timer can free you up to enjoy your summer and do the things you want to do instead of having to spend hours trying to keep your lawn green or your garden alive. We hope this article has been useful in helping you to decide which hose timer might be the best option for you. Have a great summer!